"Quit Your Job. Buy A Ticket. Fall in Love. Never Return.," read the T-shirt in Boracay. I mentally checked the boxes on the first two and figured I'd fallen in love with this shirt. The Never Return tempted me until I remembered I didn't have a trust fund. One of the greatest joys of independent travel is knowing that although you have a general itinerary, you can change it whenever you want. Spin the globe, throw a dart at a map. Choose your own adventure. 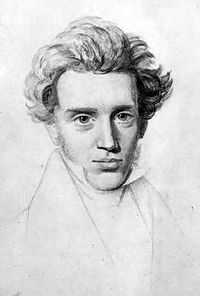 And I know that for this great freedom I owe perhaps a small debt to Soren Kierkegaard. He was the father of what is now known as Existentialism, or the "philosophy of existence." Existentialism is not just "existing," but living passionately, choosing one's existence and committing oneself to a certain way of life. Such is existence is rare, he says, for most people simply form part of an anonymous "public," in which conformity and being reasonable are the rule; passion and commitment the exceptions. He compares existence to riding a wild stallion and "so-called existence" to falling asleep in a hay wagon. Take your finger out of the socket sir! "What is the point of a house, a car, a wife and children? One day I will be in my fifties and I will awake from this American Dream and realize it was a nightmare. My youth will be gone, along with my freedom. Even if my wife let me leave the nest, I still wouldn't be able to travel Nepal on bad knees, or trek the Sahara for a month on a camel faced with mortgage payments. My window for true adventure would be gone. So, I would be reduced to what all married middle-aged men do: buy a Harley and take their angst out on the weekends, cruising long desert highways, wishing they were young and free again." So, I consciously and freely flipped the script. Instead of mortgaging my youth for a comfortable retirement, I'm spending my retirement now while my legs and heart are still somewhat young (my achilles obviously didn't get the memo). Looking back today, I realize how self-centered this little narrative is and I cringe a bit when I think about it. So don't get me wrong. I realize ever more today that the younger Nemo who thought these things was glorifying this lifestyle beyond what it truly is. Especially as I grow older I recognize more and more the wonders of children, family, and a place to truly call home. When I see my cute nieces and nephews romping around and the contented smile on my friends and siblings faces, I know that I am missing out something profound and meaningful. There is someone I know that is a true adventurer, an existentialist who lives life to the fullest. When I was younger she was my inspiration to move to California. When she had her 2nd child, she confided that she envied my life. But I know now that the grass is always greener, and that despite her current difficulties she had chosen the right path. Because one day I too will grow old, and my mortgaged future will suddenly grow near and very real. And I will have nothing to show for it but memories. So, like her, I rationalize my decision. Life is so sweet and so short. I could die from a sea-snake bite tomorrow, or come down with dengue fever far from any hospital. Likewise, at home I could be killed crossing the street on any given day. Nothing is guaranteed. And so, I don't worry about tomorrow too much. The green palms, white sand, and turquoise water in front of me, as I write this, make it OK.
"Against the calm deliberations of so much of history of philosophy, in opposition to the celebration of reason and rationality, Kierkegaard celebrates the irrationality of life, the passions, the unknown leap."